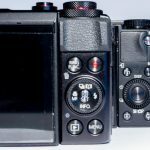 Home / Digital Camera Comparison / Sony DSC-RX100 III vs Canon G1X Mark II Comparison, Which is better? On the outside, it does not look like much and the truth is that even though internally there are similarities, they will not be mistaken for twins. One is pocket compact and comes with an integrated viewfinder; the other is compact in size, has a blunt aspect and lacks a viewfinder. One has a 1 inch sensor in the front and comes with 20 megapixels and the other has a size close to the APS-C and some 13 million points. And neither of their respective zooms bear a resemblance. Despite these differences, those of you who have money to invest in a compact camera, will have surely have included these two cameras. We are talking about the Canon PowerShot G1 X Mark II and the Sony Cyber-shot DSC-RX100 III. Despite their enormous differences as they aspire to be the choice among those who look for quality images, and are an advanced option in a relatively compact size. Since we don’t need to know a lot to come to a conclusion evidently ( we are before two excellent cameras). We have decided that instead of analyzing them seperately it is better to compare them and discover which one is the better compact with variable focal optics. At least until photkina gives us more information about this. An early release for the more impatient: In general the quality of the images of both models lives up to the expectations of the more demanding. In the majority of the cases they offer results- with differences derived from the same size of its sensors – they are very similar. Therefore, at the time we decide for one over another you can’t base your decision solely on image quality, but on other characteristics. Starting with the size and design, which as the first to start can push to prefer one over the other. So that those who look for something with a pocket won’t be lazy and have it easy. RX100 III. 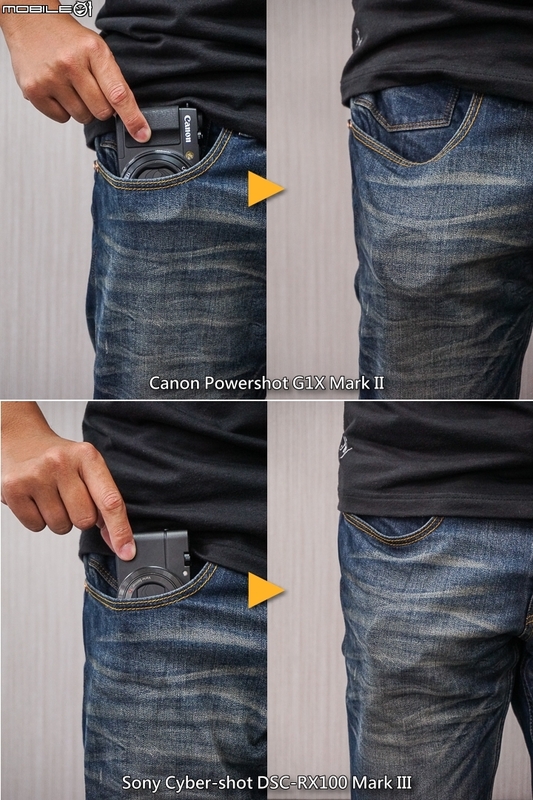 The Canon, meanwhile, honors the Powershot G series with more forceful lines. An excess, in our opinion, but in return offers superior construction, firmness and resistance. We are before a compact that weighs more than many mirrorless models with interchangeable lens. These dimensions also result in a very superior ergonomics in the case of the G1 X Mark II, with a comfortable handle and an optics barrel for easy two-hand use. 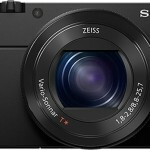 The RX100 III dispenses with all this, but is able to sneak into our pocket. It is, as always, a matter of preference. In regards to grip and ergonomics we have a clear winner. Things are not so clear when talking about the distribution of the commands and handling. In the case of the G1 X, the fact is that the amount of commands, shortcuts, and personal settings options is overwhelming. The two rings located on the barrel of the lens are very useful, especially the one closest to the camera body, the rotation is done by clicks. Using it to control zoom in steps is wonderful. The second ring of continuous rotation can also assume different functions, but the truth is that the response time is too slow if we use it to adjust the aperture. As you can see, in many ways the Canon model behaves as a kind of mastodon: safe and reliable, but it’s not very agile. By the way, this camera cries for screen menus like the one in the EOS and not the ones it uses, which are more typical of the family of compact series. In the case of Sony everthing is very simplified. A small mode dial at the top, a rear dial and especially a configurable front ring that divides the work with the help of a personalized function button. The range of resources is not as great as in the PowerShot, but given the limitations of its size it is not bad. Curiously, despite the limited space available, Sony has found a niche in your camera for casting the first integrated viewer that can be seen in this series. This uses an ingenious folding viewfinder, located on one side of the body. Once activated, truth is that its dimensions are generous (considering the overall size of the camera in general, of course) and their quality does not disappoint (remember that this is an OLED panel with 1.4 million points). It’s not anywhere near the best display on the market, but compared to what seen so far in other pocket compacts, in this case it’s not only an ornament but we can work with it without problem. Canon, however, has chosen to dispense with any type of viewfinder in this second generation of the compact star. Not that we miss the optical viewfinder of the G1 X which we once criticized for not being useful, but it is true that with this size and price not having some kind of integrated solution draws attention (yes a viewfinder EVF-DC1 is available as an option, but we have to pay 240 dollars for it). Facing each other, the PowerShot is evident in this section. Regarding the screens (they are 3 inches and swing up to 180 degrees in both cases) we have no complaints, although again we are surprised at how bulky the monitor used by Canon is compared to the Sony monitor. It is not a simple aesthetic question: it’s that the screen is bothersome when we want to operate the rear dial of the camera. At the time we talked about the first generation G1 X as a great compact, with excellent results but terribly slow. Now things have improved greatly, beginning with the burst, which boasts 5 frames per second. It is a considerable amount but you must think about it, since it’s barely limited to shooting in JPEG. Cadence is noticeably slower if we work in RAW, with just 2 shots per second with fixed focus, and even less in continuum. And since we are talking about a camera aimed at this type of photographers who regularly work in RAW, then we have a problem. Moreover, if we compare this data with the RX100 III specs, leaving aside the maximum speed mode at 10 frames per second (it works but then it requires patience to wait till the camera gets the buffer back), the Sony model is more consistent and stable: approximately 3 frames per second that are kept beyond 50 consecutive shots in both JPEG and RAW. The burst theme is not an exception, as it perfectly sums up the general characteristics and behavior of both models. Canon has improved agility in this second generation models, but despite this, the experience of using the G1 X Mark II keeps being its main Achilles heel. The same goes for the autofocus, another subject in which the RX100 III is somehow better. In favor of the Canon, I must say that the touch screen is very helpful to choose the focal point in the scene very quickly and conveniently. Something that Sony still needs to improve in terms of interface, as we noted when testing previous models. In the long list of differences between these compact digital cameras, optical specifications rank high. In fact, the 24-120 mm f2-3.9 zoom of the Canon alone could be a reason to opt for it instead of Sony, as it stays with the 24-70 mm Zeiss Vario-Sonnar T*. But as a point in favor of the Cyber​​-shot, you must recognize that Sony engineers have done a great job getting these focal lenses compressed at that size, and with a stunning luminosity of f1.8-2.8, everything with excellent results in terms of performance in corners and aberrations. However, the new features of the G1 X Mark II in this article are not far behind. Canon has not only extended the zoom from the previous generation, from 4 to 5 increases and with more angular, but improving also brightness (f2-3.9) over the original G1 X, which conformed to 28-112 mm f2-8-5.9. As always, there are the samples to speak for themselves. In any case, with our magnifying glass in hand, the first thing we discovered is that, leaving aside the differences in color and field depth, neither clearly wins over the other: something that could be interpreted as a victory for Sony, with a smaller sensor that ties this match. In fact, with low sensitivities, the level of detail of the RX100 III is somewhat higher, but starting from 3200 ISO the noise levels and loss of resolution are more evident; however, it’s not really a big difference between the two models. Canon G1X M2 – A mode, f/2.0, 1/500s, ISO 100, 24mm. RX100 M3 – A mode, f/2.0, 1/640s, ISO 100, 24mm. Canon G1X M2 – A mode, f/3.9, 1/800s, ISO 200, 120mm. RX100 M3 – A mode, f/2.8, 1/600s, ISO 200, 70mm. Canon G1X M2 – M mode, f/11, 15s, ISO 100, 24mm. RX100 M3 – M mode, f/11, 15s, ISO 100, 24mm. Canon G1X M2 – A mode, f/8, 1/250s, ISO 100, 24mm. RX100 M3 – A mode, f/8, 1/320s, ISO 100, 24mm. Canon G1X M2 – A mode, f/8, 15s, ISO 100, 24mm. RX100 M3 – A mode, f/8, 15s, ISO 100, 24mm. What if we want to record video? Canon has once again neglected this in the second generation of its G1 X models, though the new Mark II offers recording of 1080p and 30p sequences, with a flow of up to 24 Mbps. The lack of manual controls to record video clips, or even the option to focus manually (which is strange to us, because we have yet to find this option), indicate that this is a great compact digital camera in which videos are a secondary subject. In the case of Sony, things are looking a little better, as it is already the case with previous versions. Furthermore, the RX100 III comes with improved video recording, with the introduction of the XAVC S format, a new system that uses the entire sensor resolution (then logically rescaled) to record video files of up to 1920 x 1080 pixels at 60p with a flow of up to 50 Mbps. All this translates into a level of detail that is much better than in the previous RX100, topped also with an excellent image stabilization system. In other words, we are facing in this case a very decent video tool. It’s a pity the absence of a micro connector to carry it in your pocket. We have already mentioned that this is a difficult comparison because the similarities between the two models are almost as many as their differences. And for what you would expect for the price, the two are great in their own way if we consider them separately. The PowerShot can boast of its excellent ergonomics and design, very good quality image and a 24-120 mm zoom which allow us to deal with almost everything. If we add the advantages and the control of field depth offered by its large CMOS, it is clear that it is a great compact digital camera, both literally and metaphorically. 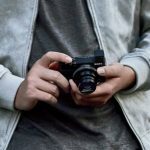 The RX100 III merely improves a formula that is giving Sony their joys: a compact digital pocket camera with exceptional quality, now with an integrated viewfinder, and while it is limited in optical features, it has perfect luminosity levels. It’s not cheap, but given the results, we would not hesitate to place it on top of our comparison analysis above the G1 X Mark II model. Unless we find something more consistent or we find Sony’s 70 millimeters too short, neither for results nor agility nor advantages the PowerShot really wins over the Sony. This time the little fish eats the bigger one. However, the small fish is also a bit more expensive. Previous The Fuji X-T1 “Graphite Silver Edition” is leaked, luxury version with new firmware.